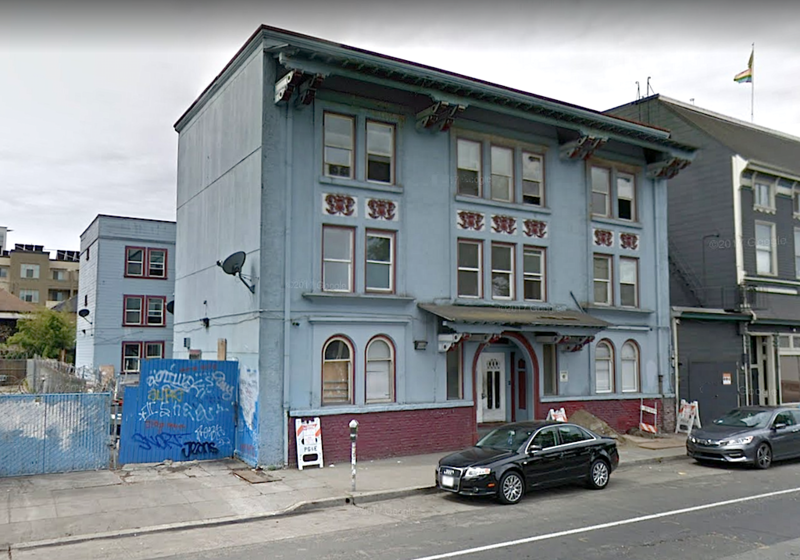 The City of Oakland is about to significantly expand its number of city-owned shelter beds for homeless residents by purchasing an SRO hotel on W. Grand Avenue for $7 million. According to a proposal that will be voted on by the city council on April 10, the new property consists of 70 studio units with shared bathrooms and a single kitchen on each floor. Oakland plans to model the building's operations after the Henry Robinson Multi-Service Center, where recently homeless people are sheltered for months at a time while they work on building independent living skills, access drug rehab programs, and seek employment and education opportunities. According to city housing officials, 275 people were housed in the Henry Robinson last year, and 143 of them successfully transitioned into permanent, stable housing. The new building eyed by the city — which was formerly known as the West Grand Hotel, and before that the Palm Hotel — has the capacity to shelter up to 140 people at a time. The opportunity for the city to buy the old West Grand Hotel comes after many years of trouble for the property. Oakland plans to purchase the building using Measure KK bond money approved by voters in 2016 for affordable housing and anti-displacement efforts. Its previous owners — including a Beverly Hills personal injury attorney who used a Georgia-registered shell company, JMO LLC, to buy the building — were sued in 2014 by City Attorney Barbara Parker for numerous fire and building code violations. Parker described the hotel as being "extremely unsanitary" and "unfit for human habitation" due to infestations of cockroaches and rats, a lack of fire alarms and extinguishers, and a sprinkler system that had gone without an inspection for five years. JMO, LLC sold the property in December 2015 for $2.46 million to the current owner, Uptown Residences LLC, a company created by Phillip Wang, a Hayward-based realtor. Wang did not return calls seeking comment. Wang's company is currently doing renovations to the hotel, including installing new floors, lights, sinks, and other amenities. The city has been negotiating with other SRO hotel owners over the past two years to acquire their buildings, but in other cases the hotels have been sold to investors who are renovating them into boutique hotels or market-rate apartments.